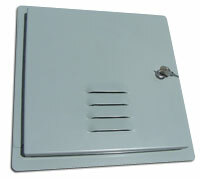 Nema Enclosures Manufacturing produces a wide variety of enclosures with different rating and materials. Our UL file allows us to manufacture and UL list Nema 1 rated enclosures. We have found over time that products with this rating are not the best fit in our custom make to order processes. Nema 1 rated enclosures do not require the heavier construction techniques that we use as part of our standard manufacturing process and we find we are not competitive in this product type. If a simple Nema 1 commercial grade enclosures is what you are looking for we are not your best source. Nema Enclosures manufactures quality custom and standard NEMA-rated enclosures. Contact us today to learn how we can expedite a custom enclosure and produce cost-effective standard NEMA-rated enclosures to protect your equipment.